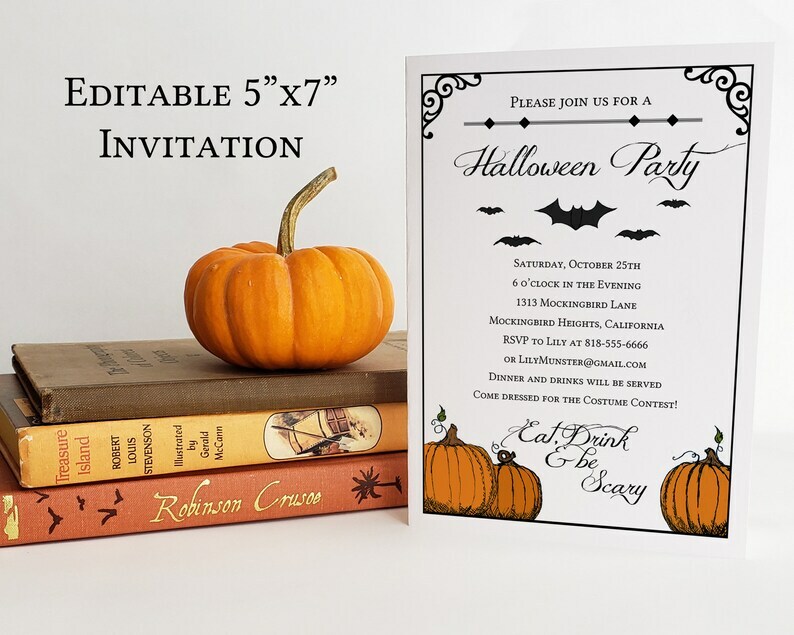 This listing is for an editable Halloween Party downloadable invitation. Edit yourself in Adobe Reader and print immediately! Designed to be printed at 5"x7" or 2 invitations on a 8.5"x11" sheet. It is easy to print on any printer without using too much ink. - After purchase, you will receive an email from Etsy with a download link for the pdf files. - Open with ADOBE READER ONLY. DO NOT OPEN THE FILE WITH ANYTHING EXCEPT ADOBE READER - It will strip out the embedded font. - If printed on letter size paper, cut to 5"x7". 1 pdf setup to print at 5"x7"
Send me a message with any questions or check out the FAQ section below. THIS LISTING DOES NOT INCLUDE ANY PRINTED MATERIAL, ONLY A DIGITAL FILE(S). FOR PERSONAL USE ONLY. NOT FOR RESALE. Easy to download. We used for a friend moving away. Thank you! I accept payments through Etsy and Paypal. If you need to cancel your order, please tell me as soon as possible. Once an item has been sent, orders cannot be canceled. Instant download items are non-refundable once they have been downloaded. Digital items cannot be returned after you have received them. If you're unhappy with an item, please let me know and I will do my best to fix any problems. An Instant Download order cannot be cancelled once you have downloaded the files. Custom items cannot be cancelled once they have been emailed to you. If I made a mistake on any item, please let me know! I will always fix my mistakes free of charge. If you made a mistake in the custom wording you sent me, I offer a one time correction within 2 weeks of ordering. After that, there is a $5 fee to make additional changes. Please let me know as soon as you find a mistake. without direct permission from Shameron Studios. For information about licensing a product, please contact me. How long will it take before my item is sent to me? Can I have different text than what is shown in the item's picture? If it is a custom item, such as an invitation, then yes! You can send me any text you want to include and I will make it look amazing! Editable items can be customized by you using Adobe Reader. Not all items are Editable and not all text can be changed. Please read the individual listings "Item Details" to learn more about the specific file in which you are interested. Other items can be customized for an additional fee. Customizing an Instant Download item will cost extra because you're paying a designer to make something just for you, exactly the way you want it. Where can I print my digital item? Anywhere you want! All my digital items are designed to be printed on home printers or at professional print shops like Kinkos/FedEx or online by companies like mpix.com. If you want to have an invitation printed at a photo printing location, let me know when you order it so that I send you a jpg file. Most (but not all) of my items are designed to print on 8.5" by 11" paper and the invitations can be setup that way too. Please read the individual listings "Item Details" to learn more about the specific file in which you are interested. Editable Signs can be printed at 8"x10" or 16"x20" at home, office printers or photo printers (must convert to jpg for photo printing). How do I edit an Editable item? All the "editable" items you see in my shop are Adobe PDF forms. The fonts are embedded and the words can be edited by you using Adobe Reader. The listing photos will show you the editable form fields. >>>You must use Adobe Reader on a computer to edit the form fields. If you open the file in another program, it may strip out the embedded font in which case you will need to download a fresh file. Please read the individual listings "Item Details" to learn more about the specific file in which you are interested. Editable School and Birthday signs come with a detailed instructions PDF with screenshots to show you how to edit the sign. PLEASE READ THE INSTRUCTIONS BEFORE CONTACTING ME. I get so many messages, it's hard to answer them all. Why can't I edit the Editable item I bought? While some things may work in some other PDF viewers, it will only have all the features in Adobe Reader. If you're still having trouble, please contact me and include a screenshot of your item. Why can’t I save my Editable item? Can I buy an individual game or just a few of them? You can use the coupon code gamebundle17 to get 30% off purchases of 2 or more games. Can you send a proof prior to purchase for a custom item? No, instead I give you a free round of changes. You must purchase the item before I start working on it. Otherwise, if I sent you a proof and you decided not to buy it, I would have just done all the work without making any money. This way, I never have to send a "proof," which just takes more time and would therefore make it more expensive. I can just send a completed file without worrying that someone will steal the design and not pay for it. If you have any changes, you're allowed one free round of changes. If you're buying a printed item, I will send you a digital proof after purchase. How do I fit more text in an editable field? In Adobe Reader, you can press Ctrl+E or Cmd+on Macs to open the Font Properties menu. You can change the size of the font to accommodate more text. Just be careful not to make it so small that you can't read it. In an effort to spend more time with my new son, I'm not accepting custom orders right now. Editable Breakfast at Tiffany's Bingo Party Game || Bridal Baby Shower Birthday || Instant Download Digital Printable File || 2 /8.5"x11"